Established in the year 2004, Kandhamal Zilla Sabuja Vaidya Sangathan (KZSVS) is a forum of traditional healers (Vaidyas). Focusing on the rights and recognition of traditional healers and restoring use of traditional herbs and plants for treatment of the underprivileged has been the core objective. It operates in three remote blocks of Orissa namely Daringbad, Noah Gaon and Kotgarh where even now reliance is on traditional means of treatment due to lack of other medical facilities. KZSVS, so far, is the only organization in its area of operation providing health care through traditional means. Though the primary focus is on health, the other objectives include promoting livelihood, women empowerment, self-governance and conservation of bio diversity. KZSVS has been constituted by a band of like-minded social activists and dedicated volunteers with experience of more than eight to ten years each in relevant sectors. The founder of the organization, Dr. Dinabandhu Maharana has extensive experience in the field of Ayurveda, Naturopathy and Yoga Sciences. It is listed with GuideStar India. Posted an income of Rs2.6mn in FY13. A substantial contribution (39%) was through Government Agencies, followed by Individual donations (23%), Grants (21%) and NGFAs (13%). (Ref Fig 1). These contributions are specific to standalone programmes. 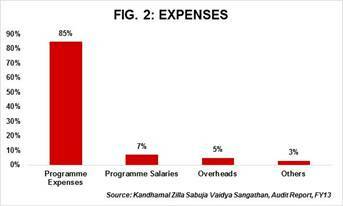 Total expenses in FY13 were to the tune of Rs2.7mn with Programme expenses accounting for 91% of the total expenses. The sector average being 79%, this indicates effective utilization of funds for the purpose of organisation’s objects. (Ref Fig 2). KZSVS has accounted for depreciation in an inconsistent manner. This has led to understatement of income by Rs37,000 in FY10 and overstatement of deficit by Rs47,000 in FY13. Current Assets amounting to Rs1.6mn for FY12 and FY13 consist of grants receivable from MGNREGA. More than 50% of total funds in FY13 are earmarked for the purpose of purchasing assets. Contribution from Government and individuals has shown an increasing trend over the years indicating increasing trust in the organization. The funds utilisation ratio is 100%, however, the funds are insufficient for meeting existing expenses as is evident from the increase in loans to Rs0.3mn in FY12 and FY13 as compared to Rs0.1mn in FY11. Income growth in FY13 is 9.5% as compared to a sharp growth of 129% y-o-y in FY12. 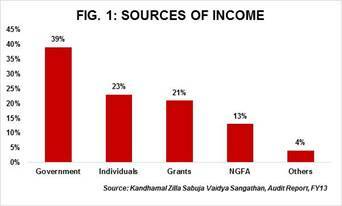 This can be attributed to more than 50% increase in contribution from Government sources and individuals in FY12 as compared to FY11. Lack of funds for general use as the funds received from various sources are project specific.